Thanks to everyone that donated! 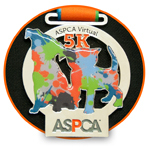 I was a few days late, but I completed the 5K today in a record-setting 44 minutes. Denise was not happy about all of the Mountain Dew I consumed along the way. Thanks again for supporting me in a great cause!